This button cross is my first attempt. 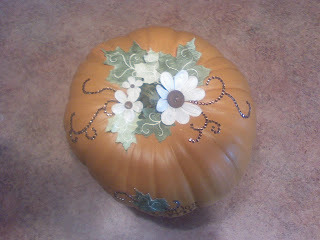 I hope to make various others for the craft show. I LOVE this post-it version of a cookie sheet calender. It will be available for custom order. I've had my eye on one of these laminate purses for quite awhile now and I FINALLY made one thanks to my dear friend Jean! I tried to stitch on the sides and it didn't look very good after the laminating-but I really like the front and back-my colors of course! These are a few Halloween creations. This is a candle holder-with a fake tealight. 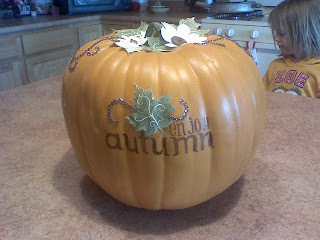 TOO CUTE-especially with the Halloween shadows! I've also made a Christmas one-but it will likely be re-vamped. This little witch is a box sack and hold m&ms. Frankie card-all out of punches except the hair. The mummy is probably my favorite. His ribbon says EEK! This is the inside-lifesaver mint eyes that remind me of the Geico commercial! I'd love to send you a set of them. Leave me a comment telling me your favorite item shown here-and your favorite thing about Halloween! I'll pick a winner and send them out this week! I had an AMAZING weekend attending a Close to My Heart Stamp Camp in Las Vegas but it all disappeared when I had to return to the realization that we have 2 additional adults living with us-who can't seem to pick up after themselves! Ugghhh- Chris' brother Curtis and his wife Paula wanted to escape their formal lives and challengs and begin again-here. I agreed-but I didn't ralize that that would mean I would have to adjust to THEIR MESS! Chris said that after a few days of letting them settle in we'd have a 'ground rules' talk, however now he has recounted that, because his brother is so easily upset and quite irrational. Seriously? Empty cans, dirty socks, empty botles, shoes, etc. all ON MY FLOOR?! Not to mention finishing off food or drinks without alerting me or replacing them. How am I expected to withstand this? I expect my home to be in prestine condition-and did I mention they brought a PUPPY?! I am 22 weeks pregnant now and after awhile I just can't be held responsible for my actions.....It is straining my hubby and that is by far the WORST PART. I am frustrated-his brother doesn't want to deal with it and then Chris feels in the middle, wanting both of us to be happy. What am I to do and how am I too cope?! This is NOT what I had in mind-after all, 2 more adults means 2 more to clean and help, right?! At first I doubted myself and my expectations, but I have never pretended to be anything I'm not or anything other than who I am-and this is unaceptable. As a bonus project for our ASA challenge blog, I created a crapped pumpkin! The leaves are stamped from CTMH and I quite like the outcome-enogh that a few more a re in the works! It's been a rough day. I would have liked to have taken the kids downtown for Balloon Fiesta celebrations, but they just didn't deserve it. Mostly my daughter that is. It's so difficult-Jace did everything as asked but Aubrey threw a fit. I wanted to go too but I couldn't justify it :( We managed to get my entire room clean (the kids had their own mess in there as well) and I'm REALLY behind on laundry! Ugghhh.... We were also going to have a big slumber party tonight with my BFF and her children, as both of our hubbt's are out of town-but her daughter was exposed to H1N1 at daycare-so we're keeping our distance. Needless to say, things aren't going according to plan-but they never do! Yesterday I signed up and paid for my 1st ever craft show-as a vendor that is! I'm excited-but nervous. It'll be mostly to advertise teaching paper carfting to thos interested-and custom orders-but I hardly feel qualified! Thinking of you all today-especially Julie and Lizard, my loyal commentors! Blessings. Yesterday we were informed that a kindergartener in our elementary school system passed away from H1N1. A 5-year-old little girl. I have a 5-year-old little girl! I feel helpless, fighting something I cannot see. This particuluar little girl had NO SYMPTOMS, which is even more frightening. What's a mother to do? I know-hand washing, cough in your arm, etc. But, where's peace of mind to be found? !